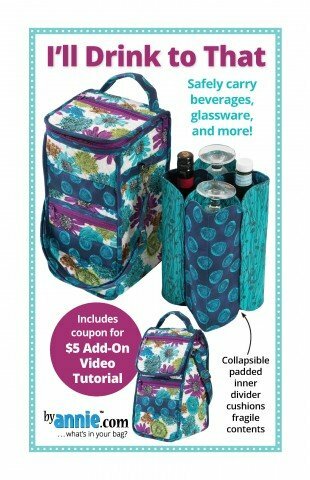 I'll Drink to That is perfect for safely carrying a variety of beverages, glassware, and snacks! This handy carrier has two zippered front pockets and a removable, collapsible four-section padded inner divider which cushions and protects up to four standard-sized (750ml) bottles of wine or an assortment of bottles and glasses, bottle openers, napkins, snacks and more. The flap on the top of the bag zips closed to keep everything safe and secure. Or, if the bag isn't full, the flap may be folded over and closed using hidden magnetic snaps. An I'll Drink to That tote makes a great gift or perfect housewarming gift, too. Happy stitching!